Genesis Gain Ground (USA/Europe) in 11:40.57 by oneeighthundred. Gain Ground is a game about robots killing cavemen and cavemen killing robots; or at least that's what it looks like. Don't worry too much about the plot. It's a fast paced overhead run-and-gun with characters and enemies from 5 different time periods. 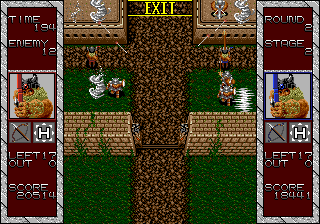 Originally an arcade game, this Genesis port has 10 extra levels in it. In this TAS, both player characters are controlled and shots are precisely placed to defeat every enemy in every level at blinding speed. Many precise tricks are used; details and stage-by-stage rundowns are available in the author's comments.